I am planning on filming a 'whats in my bag' video as soon as I get my You Tube channel up and running in the next couple of weeks, but for now I thought I would share my handbag essentials with you all... the things that are always in my handbag, no matter where I'm going or what I'm doing. 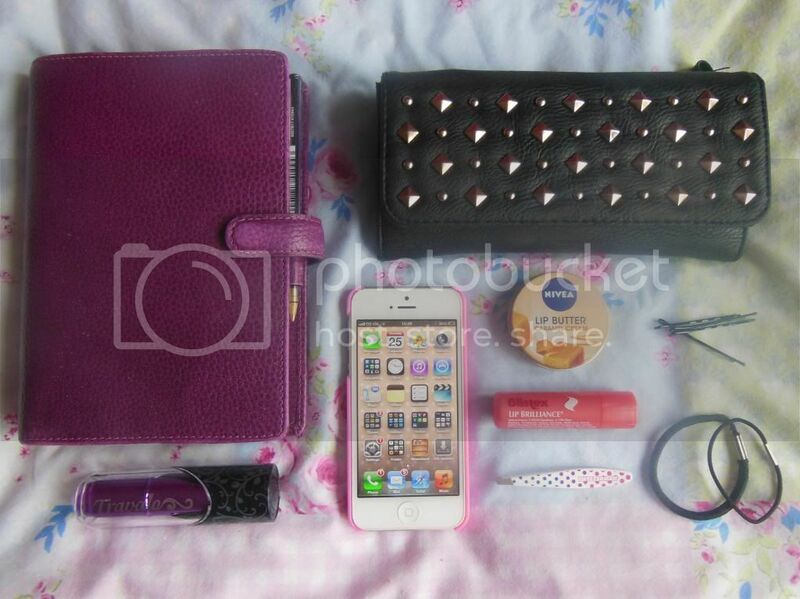 The most obvious thing that I carry with me in my bag is my phone. The odd days when I leave it charging beside my bed and go out without it, I feel completely lost and cut off from the world. I'm an absolute phone addict and I'm constantly checking my emails and refreshing Twitter & Instagram. I am currently using an iPhone5, and I love it. I've had iPhones for around 4 years now, and I will never stray and go to another brand... I don't see the point. If it 'aint broke, don't fix it and all that! Another obvious one; my purse. This studded one is from Primark, I bought it last year, but they're still selling very similar ones now. I like it because it has a separate place for notes and coins, and lots of card spaces. Some of my friends find it strange that I always have my Filofax & pen with me, but it's something that I am constantly using or referring to. I like to be organised, and to have things written down and planned. Wether it's an appointment, a shift at work or just a meal with friends... I write it all down, I also use the notes section for blog ideas. The other bits that are always with me are all beauty related. I always carry my mini Tweezerman tweezers around with me, as there is nothing I hate more than stray eyebrow hairs. If I can feel a new hair coming through which needs plucking and I don't have my tweezers with me, I feel like I'm going to go crazy! I'm going to write a full blog post about my Tweezerman soon... they are definitely worth the hype. Rather than carrying round an expensive perfume of a big bottle of body spray, I always have my Travalo with me. These are super handy, you can decant any perfume into it to carry around in your bag. I currently have my Body Shop Coconut Body Mist in mine. I always get dry cracked lips, so there's usually a few lip balms in my bag, and the odd days where I go out without one, I always end up buying another! My current favourite is the tinted Blistex Lip Brilliance and I also have an old favourite, the Nivea Caramel Cream lip butter. Last up, always in the very bottom of the bag, in the hardest to find spot are my hair grips and bobbles, I've got so much hair, it's not really safe for me to go out without these... if it rains on me or gets too windy I like to have the option to be able to tie my hair back out of the way. I hope you've enjoyed this post, and like I said, there should be a whats in my bag video on YouTube from me really soon! So neat and lovely, I love the filofax especially! My handbag is an absolute tip, I should clean it out and have a go at one of these posts! The tweezers made me laugh for some reason, because I thought to myself I am the same, they are always chilling in my bag somewhere haha!